When your craving for Asian cuisine kicks in, skip the unhealthy take-out that is guaranteed to contain questionable ingredients, sugars, and carbs that will kick you out of ketosis. 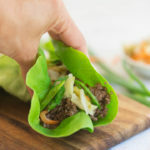 These Korean BBQ lettuce wraps are a breeze to make and wonderful when you want a special weeknight meal that is equal parts delicious and super quick to prepare. Instead of calling for slices of beef that need to be marinated, this recipe uses grass-fed ground beef. Not only is the cooking time quicker with ground meat, but flavors are also soaked in more easily. Ground beef is extremely versatile and it lets you reap all of the same benefits that grass-fed beef has to offer but in a much more convenient way. One of the top benefits of eating grass-fed beef is that it contains high levels of CLA or conjugated linoleic acids. This type of fatty acid has been studied extensively for its ability to help fight cancer and reduce the risk of heart disease. Grass-fed beef can help lower “bad” cholesterol levels (LDL), it’s higher in omega 3 fatty acids, and it contains antioxidant vitamins such as vitamins A and E which help prevent and fight disease. Eating a variety of healthy fats can help manage your blood sugar. The CLA in grass-fed beef has been shown to improve insulin sensitivity — which is necessary for optimal metabolic health and keeping blood sugar levels stable. Grass-fed beef is a much healthier option compared to other meats. Unlike grain-fed cows, grass-fed cows aren’t pumped with unnecessary antibiotics and hormones and they’re healthier overall because they’re fed with nutrient-rich grass instead of inflammatory corn. Grass-fed meat also has lower omega 6 levels. All the flavor and benefits of grass-fed steak, in a more convenient way for a busy week. Save an extra hour of time you would need to marinate your steak and have a delicious meal on the table in less than 20 minutes. These spicy Korean BBQ lettuce wraps are hearty, full of flavors, and will surely become a staple in your weeknight meal routine. Heat avocado oil in a large skillet under medium high heat. Add onions, ginger, and garlic, sauté for 1-2 minutes. Add ground beef and brown for 3-4 minutes, then add sauce ingredients (sesame oil, sweetener, coconut aminos, mirin, and rice wine vinegar). Cook for 5-6 minutes until most of the liquid has dissolved. Serve in lettuce cups and garnish with sesame seeds and green onions. Easy Homemade Keto Mozzarella SticksIntermittent Fasting and Keto: How Are They Related? Just made this- excellent- my husband said it tasted just like a similar (non keto) recipe we made recently. Yum. I omitted the Mirin because I couldn’t find any and still tasted great. I also substituted 12 drops of Monkfruit extract for the Stevia.